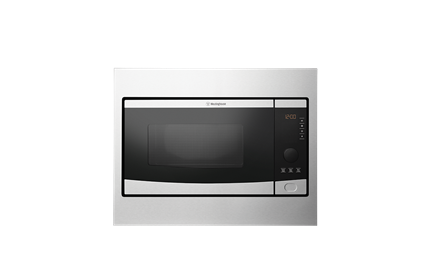 28 litre built in Microwave oven is rated 4.4 out of 5 by 20. 594W x 387D x 460H(mm) ? 28 litre built in Microwave oven. 900w, 8 programs, 5 power levels, defrost option, child lock. 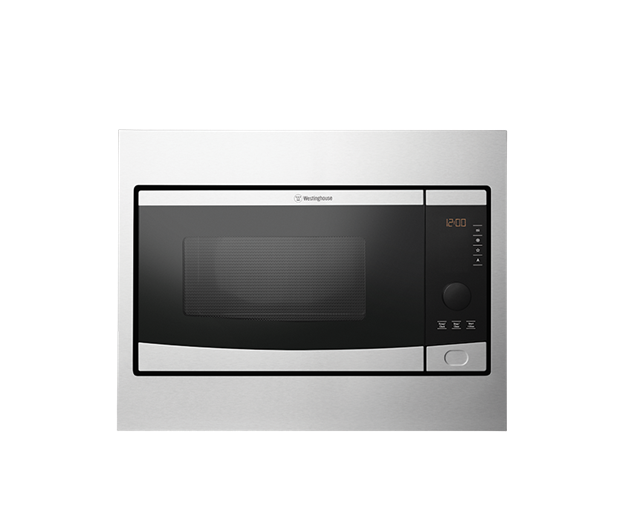 Matches Westinghouse inbuilt oven design. Rated 5 out of 5 by Rob H from Good looking, easy to use. I bought my Westinghouse microwave oven in December 2017 and immediately enjoyed the ease of operation and the enhancement to my other Westinghouse products. It’s a great buy. Rated 3 out of 5 by LizziesFarm93 from Easy to use, looks great Was enjoying using my new microwave until it died 2 months after installation. It was replaced quickly and hopefully will live a long life. Rated 5 out of 5 by Crisjoy from So easy to use Have been using this microwave for the last 2 weeks and am extremely happy with the features, size, easy clean and good looks. It is built in with stainless surround and matches my Westinghouse double oven seamlessly. So happy with the smooth look and also the userability. Rated 5 out of 5 by Jane K from Excellent product Replaced a Miele microwave with this one and it fits perfectly with the built-in kit and looks great. Works very well and I am happy to have saved a lot of money (much cheaper than the Miele). Rated 5 out of 5 by Jojon from Great features This was installed in our new kitchen and was recommended by the company. So far we have found it easy to use with great features and is extremely quiet. Seems like a great product. Rated 5 out of 5 by R27alan from Easy to use, looks great and easy cleaning I’ve had this microwave for a month now and I am really happy with it. It works great, looks as good as my old expensive AEG one without the expense and is easy to clean.